Could lunch running become MY thing? The other day one of you my dear readers put a bug in my ear. Following the post I wrote earlier this week lamenting my lost running hours, Jocelyn over at Alberta Diabetic Girl suggested I run through lunch. Hmm… I honestly don’t know if I can make that happen, but by golly I am mighty intrigued by the idea. Since going back to work on Tuesday, I have yet to get a run or strength training in. I’ve had good intentions when climbing into my car at the end of the day, but the first day there was an accident on the highway, which kept me in the car for nearly 2 hours, and the two other days, it was just a long commute, as they all are, and by the time I get home, I am thoroughly exhausted, and by the time Little Ring is tucked snug in his crib, I’m practically comatose. I know I should be trying to get out, or putting an effort in with my strength training, but I just don’t have the energy. And I know it’s only the first week, and surely things will get easier, but still, it’s having a debilitating effect on my mental state. Goodness knows I’m already an emotional wreck what with going from full days with my boy to now just 1.5 hours a day through the week. Add to that the loss of my surefire pick me up of running, and you might as well just lock me up in the rubber room right now. But running at lunch, well hey now, surely I couldn’t be exhausted in the same way at that hour, and surely it would be a nice way to break up the long day, and surely it would give me a surge of energy which I very much need come those afternoon hours. The only thing, though, we don’t have showers at my work. I’m not concerned about my face, that’s no problem washing and reapplying a little foundation and blush. But my hair is another issue. It’s not long enough to tie back in a stylish ponytail or bun, but when I run I can’t stand having it in my face, so sporty pigtails, which aren’t exactly work appropriate, are necessary. And I sweat, my gawd do I ever sweat, and my hair gets damp, and I only have an hour lunch, and yeah, I’m thinking I might be looking like a bit of a disaster the rest of the day! Mind you, it wouldn’t be any worse than being caught in a rainstorm and we do live in a rainy climate, so…. Looks like I’m gonna have to do some route research!!! 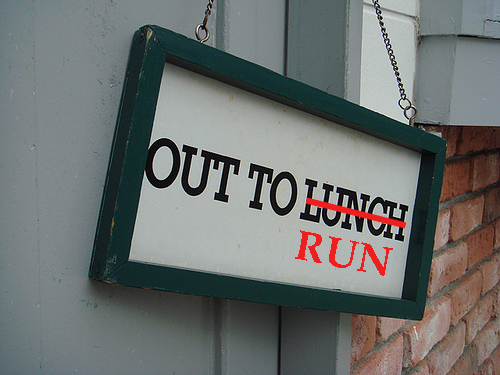 This entry was posted in Running, Training and tagged lunch hour running, running at work, training. Bookmark the permalink. Your problem is the shower part. Could you end your run at the community rec centre? is there a YMCA in Chiliwack that you could use their showers? Or even a pool or fitness centre? Yeah I hear you on this one. I sweat – A LOT! there’s no way I could run and then go to work.